Roger Tillman is among the most experienced hip surgeons in the UK. He is a former revision hip fellow at Wrightington Hospital (where Sir John Charnley developed the modern hip replacement) and has performed over 4000 hip replacements in the private sector and NHS. He is a member of the Royal Orthopaedic Hospital Arthroplasty (joint replacement) service, and has an extremely low complication rate. The infection rate after joint replacement at the ROH is the lowest in the country, and Mr Tillman has a zero percent MRSA infection rate for primary joint replacement. For most patients, Mr Tillman recommends the implants advised by NICE (the National Institiute for Clinical Excellence) I.e. the Exeter hip or the Charnley hip. These are tried and tested implants with excellent 20 year results. 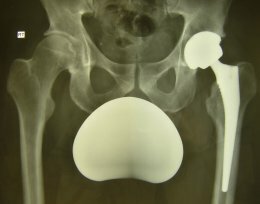 There are however other options including uncemented hip replacements and metal-on-metal hip resurfacing which are generally recommended for younger patients with higher physical demands and good bone quality. These options, with their respective advantages and disadvantages will be discussed in detail and the operation will be tailored to meet the needs of the individual patient. Following hip replacement surgery, most patients will remain in hospital for five or six days, and will be safe on stairs before discharge. Most patients are driving again within 6 weeks and a full recovery is expected by 6 months.